The musings of a consultant who attempts to explain the marketing ambiguities associated with the commercialization of technologies. Catching Up: Mobivox - Launching Voice-Enabled Conversations. About three weeks ago I had the opportunity to interview Mobivox's new CEO Peter Diedrich, a telecom industry veteran who brings both telecom executive and VC-funded startup experience to the table. Mobivox has traditionally provided a low cost worldwide calling service, including free calls to Skype contacts. Key features included (i) no client downloads, (ii) launch a voice call from any telephone handset and (iii) access via over 340 points-of-presence in 40 countries. However, unpublicized has been that they also provide a platform for voice enabling the user interface to many other potential communications service partners. make the service "from anywhere at anytime on any device"
Given the challenges of generating a worldwide user base, going forward Mobivox plans to continue the current service but also look for opportunities to find service provider partners who can take advantage of their voice-enabling platform. To have a more complete offering they are also looking to include API's that go beyond "call control in the cloud" to include support for call completion, backend billing, CRM interface and fraud management. Their final challenge is to improve monetization; reversing a pre-appointment decision to make all but calls to Skype contacts chargeable, Peter sees the need to develop both a retail and partner customer base. pricing packages incorporating modified PSTN access "minute buckets"
The first service provider partnership was announced today with Jajah; Phil has seen a demonstration and will be commenting further. Announcements over the past few days have triggered Andy to write an excellent summary post on the state of the Minute Stealers market space. In my book we're not done seeing the end of the price drop for minutes, but we are seeing the end of where profits are found simply in minutes. Smarter companies like Migg33 and client Mobivox (as Alec Saunders pointed to) are able to leverage minutes to benefit their community members with added features and more than just minutes vs. a Jajah which only has people who want more for less. In the long run using minutes as a loss leader will be the coin of the realm, not simply minutes for minutes sake, because of what I've labeled the "no-loyalty" crowds modus operandi. That crowd goes to whomever offers free next. And Alec comments on the latest move coming from last week's Jajah-Jingl merger. I'm with Alec and will stay with Mobivox, who has almost 400 points-of-presence in 30 countries, including a local one in Toronto. It's a good move for Jajah, but it's unfortunate that dial-in numbers are available in such a small number of markets — just the USA, UK, Germany, Italy, Austria and Israel. For now, I intend to continue to use Mobivox since they've provided a local Ottawa number for me to call. And Mobivox gives me direct access to all my Skype Contacts free as well. ....and your morning weather report. XBox controller support to fly around 3D images in Windows Live Local. They seem to have left out any voice communications hardware, leaving an opening for Skype phones and related add-ons. One thing is certain: devices such as this will accelerate, but converge, the trend mentioned in this evening's keynote where the younger demographic spends more time on the Internet than watching conventional TV. PhoneGnome offers Relevance-based Call Management with Iotum's Relevance Engine . Over the past few months I have been a beta tester for the iotum Relevance Engine which has a number of interesting applications that are providing a taste of what my future real-time communications activities may have in store. Martin Geddes included a request for such a call management service in his "wish list" of premium services for which he'd "gladly pay some small up front fee and a regular subscription" charge as part of a proposed Skype bundle for small business. For a benchmark example of a response Skype can now look to iotum; this agreement between PhoneGnome and iotum demonstrates a revenue generating service that manages my calls based on my work environment. One of my challenges as a beta tester of iotum, was their assignment of a new phone number in order to participate in their trial. However, I have a lot invested in my current business number. My workaround was to forward my regular business phone number to an assigned "iotum" number and then have the call processed by the iotum engine based on the above factors. Not a simple, lowest cost, user friendly process for achieving this goal – but it's a beta test, right?. This all changes today with the announcement of a partnership between Iotum and TelEvolution, whose PhoneGnome appliance has received widespread acclaim for its unique ability to seamlessly merge PSTN and VoIP services. PhoneGnome enhances a traditional phone line with a VoIP service that provides an automatic least cost routing of outbound calls via either the PSTN if a "local" no charge call or a "long distance" call over a designated VoIP service if calling outside the local calling zone. At the same time, as with all VoIP services, it provides the ability to add calling features such as Call Waiting, Call Forwarding, No Answer Transfer, etc. managed through a web interface yet maintains access to essential services such as E911, home alarm systems and 800 numbers. As a result of this announcement, PhoneGnome now adds an intelligent call routing and management service: the ability to direct inbound calls according to "Relevance" of the caller in the correct context at the time of the call. For instance, if the caller is a key "VIP" customer, it would be forwarded to my mobile number, unless I was currently in a meeting in which case it would be sent to voice mail. But, if iotum identifies via Outlook that this caller is someone with whom I have a meeting scheduled later in the day, the call would be sent to my mobile phone regardless of my current availability status. Another input to the handling of a call may also be my current MSN Messenger status. It's all very powerful and the Iotum expert system works automatically and transparently, in the background changing my call management preferences as I go about my day working between my home computer, my laptop and scheduling and attending meetings. I set the rules; I get to change the rules. no need to wait for the legacy phone company to offer the Iotum service. It does require you also have a broadband Internet service. Simply purchase the PhoneGnome appliance and pay a monthly fee for the Relevance-based call management service. There is no ongoing subscription charge for the PhoneGnome appliance itself; you do need to sign up with a VoIP service for handling long distance calls at low VoIP rates which are usually a combination of a monthly fee for North American calls and per minute rates for overseas calls. "This deal makes sense on so many levels. Both services are really easy to set up and use and complement each other nicely." The combination of Iotum and PhoneGnome bridges Voice 2.0 services into Voice 1.0 phone installations. I think we're going to see a lot of partnerships of this caliber with iotum. And the potential partners are Skype, Yahoo, MSN and AOL at the consumer level or one of the PBX providers such as Nortel, Panasonic, Linksys (Cisco), Avaya or any other potential VoIP-based PBX manufacturers at the enterprise level. The major question is: when will these players realize that offering intelligent premium services, such as the Iotum Relevance-based Call Management service, is a key stepping stone to their future growth beyond the legacy telephone system. Both Mark Evans and Alec Saunders have been making posts about the early days of Microsoft Internet Explorer. Mark wonders where the browser world would be if IE never happened; Alec comes from the viewpoint of a former IE Product Manager: browsers are a feature and not a product. To add some pre-history from someone who was there: Mark Andreesson and some of his grad school colleagues had developed the Mosaic Web browser at the University of Illinois Champagne-Urbana ("UICU"). UICU then went out and sought licensees; Quarterdeck Corporation (of DESQview and QEMM fame) was the first licensee, signing an agreement with UICU in February or March of 1994. Then Marc went off with Jim Clark to form Mosaic Communications in early April 1994 (I can still visualize seeing the WSJ article announcing their startup). UICU realized they may have something that could be a royalty generator and signed a deal that resulted in the creation of Spyglass as a commercial entity which received the worldwide rights to license Mosaic on behalf of UICU. In the summer of 1994 Quarterdeck went through a restructuring (in which I was personally involved on the sales and marketing side); their engineers decided to build a web browser from scratch even though they had licensed rights to the UICU Mosaic code; these rights at the UICU end had been transferred to Spyglass. However, since QEMM was so highly pirated, Quarterdeck was seized with a software piracy "protectionist" mentality such that they missed the iterative “sharing” culture of the Internet. Meanwhile Marc and his colleagues developed their Netscape product from scratch (they never had a UICU/Spyglass license) and made their beta builds available on the Internet for testing and feedback starting in September 1994. (Clark et al were forced to change their company name from Mosaic Communications to something else - Netscape - as a result of a potential lawsuit by Spyglass who felt they owned the Mosaic name.) By the time Netscape launched an official release version in the spring of 1995, they had a very large, worldwide user base. Quarterdeck released its product in May of '95 but never got market share or traction; the world had already gone Netscape as the default browser. Never was sure how much real revenue Netscape was generating in its initial post-release days but, as Alec has mentioned, it certainly "sold" as a stock on Wall Street. Another recollection: At Quarterdeck we ended up re-negotiating the royalties, initially set at $5.00 per license with UICU, down to $0.50 per license with Spyglass. Eventually Microsoft came along, recognized a browser was a feature, not a product, and went on to embed IE within Windows. Zap goes any revenue model. So to put a conclusion to Mark's question about where the world would be without IE -- any browser product would have been a component of a larger offering -- either as an infrastructure application or in a developer toolkit. Quarterdeck was eventually sold to Symantec in 1998 as Symantec needed a Windows Uninstaller to avoid a copyright lawsuit on another Uninstaller product they had -- Quarterdeck had CleanSweep. If I recall correctly, shareholders got $0.65 a share for a stock that had traded as high as $39 in late 1995. One final note: one feature of the Quarterdeck browser has never made it to Internet Explorer to date - an ability to open multiple web pages in windows within a single "master" browser window. Was a great feature that has only over the past year gained widespread popularity, first in Firefox and potentially in MSIE 7.0: now it's called "Tabs". On the need to empower your lowest paid employees. Alec Saunders tonight has written about his experience while checking into the Toronto Sheraton Centre Hotel for his attendance at the upcoming Voice over Net Canada conference. With an allergy to smoke, I guess I will not be using Sheraton (or any of the Starwood) hotels as a preferred choice. Simon Cooper, a senior executive at Marriott, and a graduate of the same Executive MBA program I took twenty-one years ago, said his biggest fear as a hospitality industry executive was that his lowest paid employees were the ones in constant contact with the customer. I can say I have seen several instances, in hotel chains he managed (Delta and later Marriott) where these employees were empowered to do spontaneously whatever it took (within reason) to satifsy the customer. The most recent example is outlined in my post about the vandalisim inflicted on my new Volvo S60 three weeks ago where the staff at a nearby Courtyard Marriott assisted me in several ways with no questions asked. There is a reason Courtyard Marriott tends to be my preferred hotel chain. During a Skype chat session with an acquaintance in Sweden, I was watching the Olympic Opening Ceremony via my SlingBox as was my correspondent who was watching the Swedish TV network version. All of a sudden we found ourselves diverging to a discussion about various aspects of the ceremony. I guess you could call this coviewing! During our trip we, of course, watched my home cable channels via SlingBox from our various hotel rooms; free broadband did enter into the decision about choice of hotels. One hotel charged for broadband access; however, their free breakfast more than made up for the daily Internet charge. 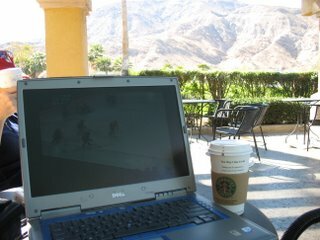 On one of our transit days, we stopped at a Starbucks in Palm Springs, CA and watched the CBC telecast of the Women's Gold Medal Hockey Game. I did record on my digital camera a video of the team singing O Canada via my SlingBox; they definitely should stick to hockey for their livelihood. Congratulations on a great performance!! Rogers, my Internet (and cable TV) provider, has started providing individual Internet usage statistics to its customers. I was away from the home office for 12 days in February of which 10 were days when I had the SlingBox available. Whereas my January usage was 8.7GB download and 1.1GB upload; my February stats showed 5.8GB download and a whopping 11.0 GB upload. Given Alec's experience with Rogers "unlimited" wireless charges, I have a bit of trepidation about hearing from the Rogers usage police, probably suspecting I am running a highly accessed web server (Not!). Last weekend I set up a High Definition (HD) television set; this necessitated moving to the Scientific Atlanta 8300HD cable box from the SA3250. Once I had completed the setup (and moved the appropriate cables to the 8300HD) I found my SlingBox player was still running on the desktop PC in my home office (without so much as touching the PC). The one caveat: the S-video output on the 8300HD only provides a Standard Definition signal -- quite suitable for SlingBox. However, since the TV itself is hooked up to the 8300HD via the HDMI cable, I cannot use the SA8300HD's PVR features on the SlingBox. There is also occasionally an annoying message about a "DVI/HDMI connection blocked" if the main TV is not turned on; however, simply hitting the Exit button on the remote control panel solves this. In two days (Thursday, March 30) SlingBox will be announcing availability for purchase in Canada. And now to install the Mobile player on my Dell Axim..